Two individuals have passed on and two have been truly harmed in an overwhelming private fly accident in South Carolina, USA. of coming to a stop it ran off the runway and crashed into a fence, breaking the aircraft into two. The Greenville Police Department says there were four people on board, three men and one woman. Two were pilots and the two passengers were a married couple. 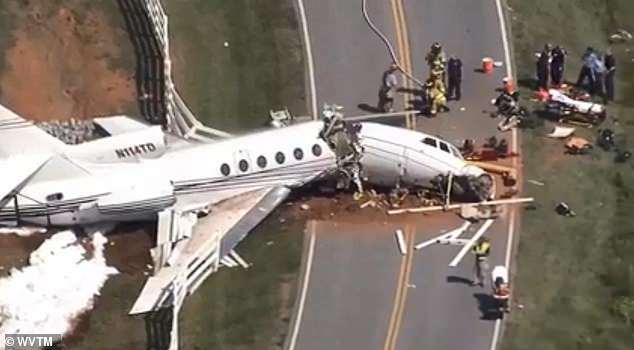 Greenville City Fire spokesman Tristan Johnson confirmed that the two people who died in the crash were the pilot and the co-pilot of the plane, according to WSPA. The passengers are in the hospital in critical condition. The victims are yet to be named. The Coroner's office said that officials are working on notifying next of kin. They say the pilots died from the blunt force of the crash. One crew member 'died at the scene of the crash and the other at the hospital', according to Deputy Coroner Jeff Fowler said to WYFF-4. Only three people were taken to Greenville Memorial Hospital following the crash as first responders worked on pulling the fourth from the wreckage. At first one individual was reported to be seriously injured. Later Thursday afternoon a coroner confirmed two of the people on board had died. 'For some reason, we're not sure why, [the plane] was not able to stop, went off the end of the runway, and crossed to the grass on the runway, that's about another 200 feet, then down an embankment and finally came to rest at the airport road,' police spokesman Donnie Porter announced after the crash. 'I believe that one of the pilots, not sure which, was either temporarily unconscious or what not but was leaning on the throttle,' he added. 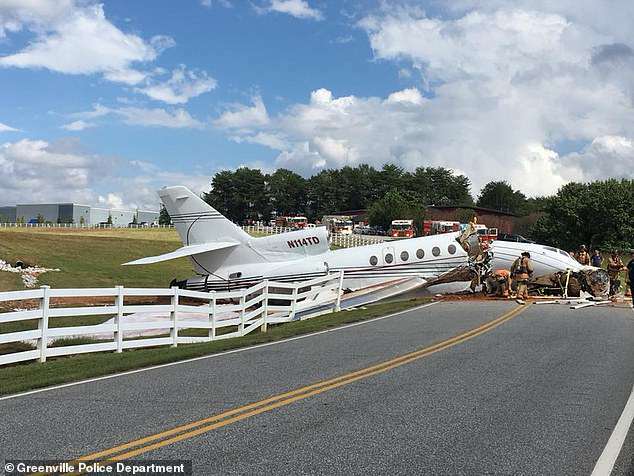 It's not clear where the plane was coming from, but it intentionally landed at the Greenville Airport, cops believe to pick up more passengers.